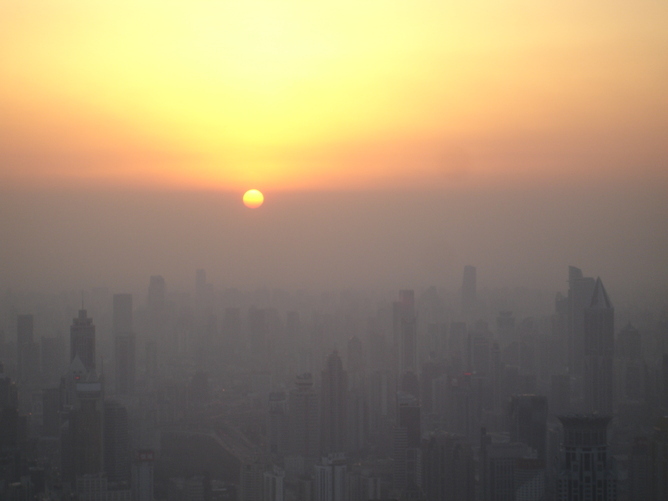 Shanghai’s ‘airpocalypse’: can China fix its deadly pollution? The current “airpocolypse” emergency in Shanghai - which has seen schoolchildren ordered indoors to protect them from the polluted air, flights grounded and companies ordered to cut production - comes at the end of a year in which China’s environmental crisis reached a tipping point. “I hardly dare to breathe”, wrote one Shanghai resident on Weibo, China’s equivalent of Twitter. It’s a sense of despair and frustration felt around the country about hazardous levels of pollution. Air pollution is a deadly problem. When thick smog blanketed Beijing early this year, there was a spike in children and elderly people needing urgent medical help, with Beijing Children’s Hospital seeing around 3000 patients a day with respiratory problems. That sparked a mass outpouring of anger and frustration on China’s social media, which has continued through 2013 and forced the nation’s new leadership to make the environment a top priority. Recently, the central government announced that it will spend trillions of Renminbi over the next five years tackling pollution, with a series of major initiatives to clean up air, water and soil. As well as facing community pressure to act, the government is beginning to recognise the huge economic and health costs of pollution, which are estimated to consume approximately five per cent of the country’s yearly gross domestic product. The big question now is whether the unprecedented sums of money being be spent on environmental clean-up can buy back clean air, water and soil in the world’s most populous nation. The environmental degradation that has accompanied China’s rapid industrialisation has been well-known since the mid-1990s, when campaigners such as Ma Jun drew attention to severe water pollution. However, until recently the authorities generally paid lip-service to environmental regulation, and were unable or unwilling to enforce rules at ground level. A “grow (and pollute) first; clean up later” philosophy was adopted, based partly on a desire to rapidly alleviate poverty, with the assumption that pollution could be dealt with further down the track. Some commentaries have recently argued that China has simply followed the same path as other countries during industrialisation, such as Japan and the United States in the last century. This implies that the coming clean-up phase in China should be able to bring the environment back to a condition comparable to those countries today. For residents now living in the midst of choking air pollution – concentrations of particulate matter in Shanghai last week were more than 20 times the safe standard – this argument will probably bring little comfort. However, it is worth taking a closer look at this comparison. It may help to give us an idea of what China might look like by the middle of this century. In China today, concentrations of sulphur dioxide or SO2 in the air are no higher than in some badly polluted Japanese cities back in the 1960s. On this measure alone, it might appear that China’s air pollution problems are no worse. However, using other metrics, pollution in China appears far worse than Japan or the US in the past. For instance, total suspended particulates in air are currently at levels five or more times what occurred in polluted US cities before the Clean Air Act came into effect in 1970. It has also recently been estimated that 43 per cent of surface water and 55 per cent of urban groundwater in China is severely polluted, while soil heavy metal pollution affects 10 per cent of arable land. A lack of historic data makes it difficult to compare soil and water pollution with other industrialising nations at the same point on their growth trajectories. Yet it is hard to believe that the world has ever seen an environmental clean-up challenge as big as the one facing China now. While Chinese citizens may be encouraged by the amounts of money being promised for new environmental controls and remediation, the current major uncertainty is by how much and how quickly pollution can be cleaned up. From a physical and chemical viewpoint, the main types of pollution can be ranked in order of their amenability to rapid reduction. At the top of the list is air pollution, which probably constitutes the most serious problem now, but which should improve most rapidly if far-reaching and effective pollution control measures are put into place. Surface water pollution would be the next most amenable to clean-up, followed by groundwater and soil pollution. The latter two may be less obvious in their immediate health impacts, yet they are no less important. They are also far more difficult to remediate because of their long residence times and slow rates of renewal. Pollution in rivers and the atmosphere have more widespread and immediate effects, but these parts of the biosphere circulate relatively quickly, allowing pollutants to be flushed or diluted once they stop entering the system. These different timescales need to be factored into the long-term planning and allocation of resources. Clearly a huge effort, over a long time-frame, targeting all parts of industry and the natural environment, will be required if China’s environment is to be restored to a condition where people feel it is safe to send their children outside, drink local water and eat local food. On his micro-blog site, Ma Jun recently asked Chinese people to consider whether, if they had been given a choice, they would have chosen to let their country become the world’s most polluted in order to provide cheap goods for export for wealthier nations. Of course, most Chinese people did not get to have a say in this development strategy, and are simply left to live in the degraded and hazardous environments that are its by-product. Cleaning up China’s vast pollution problems will not be easy - but it is not solely a domestic issue. A 2008 study in the journal Energy Policy estimated that one-third of China’s greenhouse gas emissions were produced in manufacturing electronics and other goods for export worldwide. Those emissions from exporting industries soared from 230 million tonnes in 1987 to 1.7 billion tonnes of carbon dioxide in 2005. For those of us in countries purchasing Chinese and other foreign goods, it is worth considering how what we buy affects other people. If this thought makes you uncomfortable when choosing gifts this Christmas, you do have a choice: buy less, buy local, and buy a gift that will last. Matthew Currell is a lecturer in Hydrogeology, School of Environmental Engineering at RMIT University. This post originally appeared here.